Sharpen your radar picture with high definition. The GMR 24 HD radar scanner offers a whole new level of radar performance, safety and situational awareness. GMR 24 HD features high-powered Digital Signal Processing, providing sharper radar imagery and improved target separation to recreational boaters, professional mariners and yachtsmen. This 24" (60.96 cm), 4 kW high definition radar has a 3.6 degree beamwidth and a 48 nm range. With automatic pulse optimization technology, the radar matches pulse widths and repetition rates with the nautical mile range that is selected. This gives you powerful 4 kW radar penetration and unbelievably clear echo definition at all ranges up to 48 nm. To help you avoid traffic on the water, the GMR 24 HD provides the option of MARPA target tracking when combined with a multi-function display and an optional heading sensor. MARPA tracking allows you to track the bearing, course, speed and predicted closest approach of up to 10 targets. In addition, like all Garmin radars, the GMR 24 HD has self-contained signal processing, which provides you with a more precise, easy to read signature. 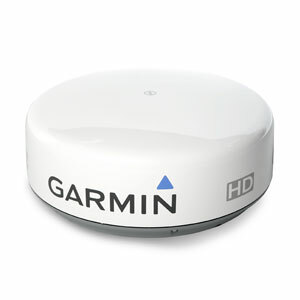 The GMR 24 HD transmits data over the Garmin Marine Network, a 100 MB plug-and-play proprietary network that gives you the ability to expand your boat’s system as needed. Once connected to the network, you can use any network-compatible Garmin chartplotter as your radar screen. And as an aid to locational awareness, you can overlay the GMR 24 HD radar image on the chartplotter's map page. You also can split the on-screen display so you can view the map and the standard radar page simultaneously.